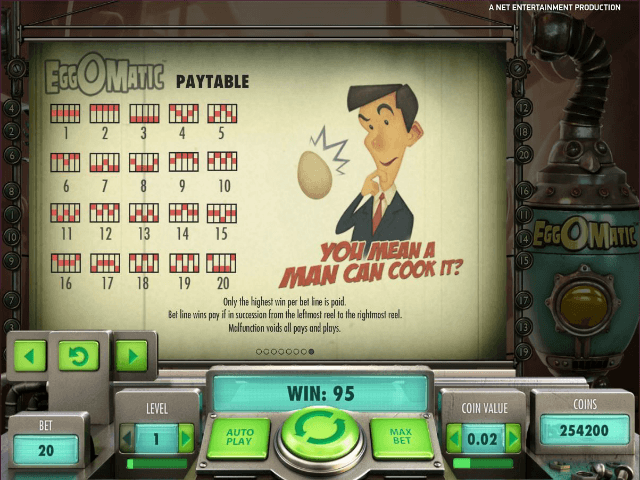 The EggOMatic online slot is one of NetEnt’s premium video slots, featuring five reels and 20 paylines. 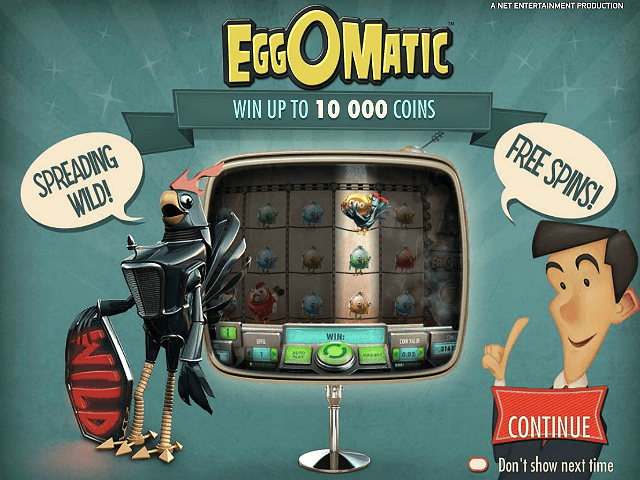 EggOMatic slot machine is as innovative and eggtastic as the machine the game revolves around, a wondrous mechanical contraption that seeks to revolutionise egg production. Follow this EggOMatic guide to find out what all the clucking is about. 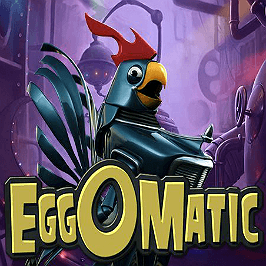 EggOMatic online slot takes its name from the mechanical contraption that the game originates from. 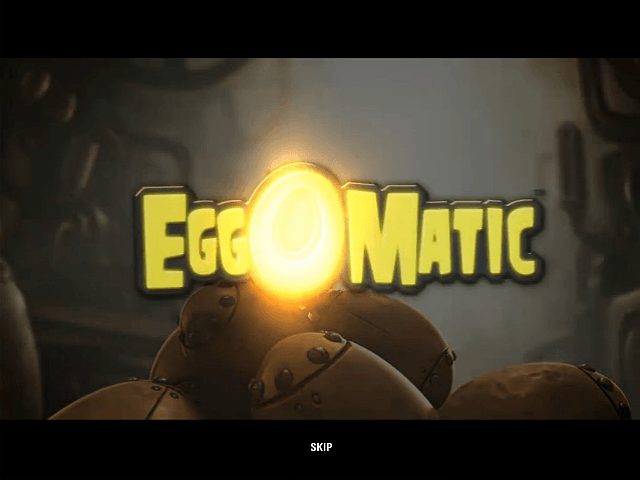 The opening cinematic shows the story of the game, with an eggotistical rooster clad in black mechanical armour devising a plan to increase egg production by fitting the hens with similar metal outfits to his own. If the chickens are unfortunate enough to land on a payline, they’re zapped with a bolt of electricity, causing a shower of eggs to fill up the EggOMatic machine. Software provider NetEnt has crafted something completely unique in the world of online slots. The opening cinematic presents the world through a send-up of old 1950s educational videos, but the main animation and character design are nothing short of eggcellent, featuring beleaguered mechanical hens and chicks waiting to be electrocuted for the good of mass-production. The black rooster’s appetite for egg production is only matched by the generosity of the return-to-player value, which hits 96.5%. 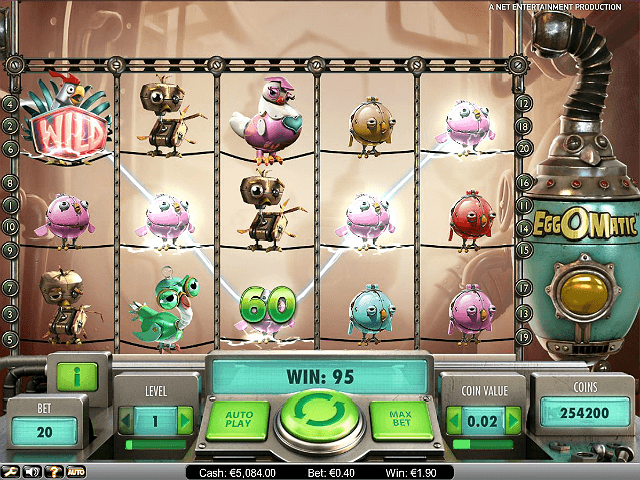 The symbols in this clucking good slot game are the chicks and hens that fill the EggOMatic contraption. They’re divided into two categories. The chicks are all the same, but their worth is dependent on the colour of armour they wear. Both the yellow and blue chicks offer a maximum of 50x the bet if you make a full reel of them, while the pink and green up this to 60x. The red chick is the one to aim for, though, paying out 75 times the wager for a full payreel. The bigger chickens and hens are more distinct, but the colour hierarchy is much the same. The dishevelled-looking golden chicken pays out 300x the bet for a full payline, the blue one 400x, and the green 500x. The pink chicken mirrors a queen of hearts and is worth a maximum 700 times the original bet, while the majestic red chicken will net you 1,000 times that. The Wild symbol is the plucky black-clad rooster that introduces EggOMatic in the game’s opening, but you’ll want to see what surprise eggs pop out of the EggOMatic machine at the right of the reels. It’ll pop out various feature eggs onto the conveyor belt directly above the reels. If these eggs are sitting about a reel that lands a Wild symbol, the egg will crack to reveal its special feature. Special bonus features can be Spreading Wilds, Coin Wins, Free Spins, and a Secret Surprise egg, which’ll reveal one of the former three. The Spreading Wilds turn all the symbols surrounding it in all directions into extra Rooster Wilds, which can lead to multiple paylines. The Coin Wins grants you a cash prize, ranging from 50 to 2,500 coins, with the maximum being 125x your initial bet. If you’re lucky enough to crack open a Free Spins egg, then you could find yourself with up to 50 free spins to play with. This cracks the EggOMatic machine into overdrive, with a random egg churned out on every free spin, meaning you could win even more. If you like Eggomatic - You'll like these slots too!